This is a book of 15 original compositions for the harp, suitable for beginners and intermediate players. These tunes are great for therapy work, performances, weddings, or just to play in your own living room. 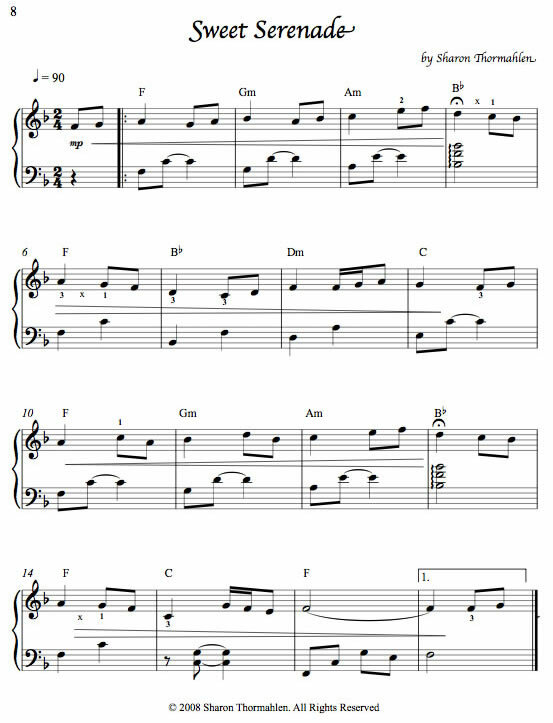 The tunes are arranged to facilitate memorization by using some consistent methods of arranging using left hand patterns that often repeat in other sections of the piece. There are 6 tunes in the key of C, 4 in G, 2 in D, 2 in F and 1 in Eb. There are lever changes in only two of these tunes. Tunes include God's Garden, Sweet Serenade, Sweepin' the Clouds Away, Summer Rain, Birds of Blue Ridge, The Last Leaves of Autumn, Harpeggio, The Promise, Winter Waterfall, September Sunrise, Mayne Island Waltz, Easy Pickin's, Between the Thorns, On the Wing and AT-etude. This collection is Sharon’s eighth book of compositions and arrangements for the harp. This lovely and accessible collection includes fifteen selections, plus an ensemble arrangement for two harps. Selections range from one to four pages each and are ideal for the late beginners to early intermediate players. Sharon has included excellent fingerings, placings and chord symbols. Lever changes are clearly marked with the diamond method and some arrangements include rolled chords and glissandos. Harpers cannot go wrong with a Sharon Thormahlen collection and her little stories about the tunes are always creative and fun. Highly recommended. In addition to Birds of Blue Ridge, I sure like The Last Leaves of Autumn, and Harpeggio! - - am sure I like the others too, just noticed I marked Between the Thorns as something to get back to, but these are the ones that first grabbed me. Boy you sure have the stuff! I received your book last week, and it's just great. The songs are ALL delightful to play and to listen to. Love those free-style glisses in 'The Last Leaves of Autumn'. 'Harpeggio' is so much fun to play... Ditto 'AT'etude' (clever title!). Your 'Birds of the Blue Ridge' gets a double A++ -- both for the music and the most interesting text that accompanies it. Your songs are absolutely beautiful. You are a gifted composer. I just LOVE having the CD to listen to -- it helps me so much. I have to tell you how much I love your books. I have all of them I think now! I have just opened Sweeping the Clouds Away and must tell you "On the Wing" made me cry! Beautiful. Keep up the great work. You provide what pleases me! I think I have every piece of music with in my capabilities! Anyway, just wanted you to know I a big fan, and trying to promote your works here in Australia. Best wishes. I LOVE your new book, "Sweepin' the Clouds Away." Some tunes just fall right under the fingers - BRAVO!! 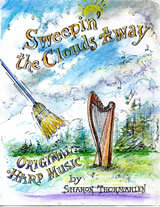 I was perusing the harp music at the local music store and discovered Sweeping the Clouds Away. My harp has become a bit of a "dusty strings" in recent times, so "Sweeping" is being a good nudge back. "Sweet Serenade" is good for harp and for my piano sight reading. "Last Leaves of Autumn" is just plain lovely--it's exactly in my sight reading range (mildly challenging without being discouraging). Also "On the Wing". I've always liked "The Promise" (and your other Jewish-flavored pieces). Thank You for continuing to provide lovely music for those of us who are and likely will be perpetual beginner-to-baby-intermediate level players. Your "Harpeggio" is positively fantastic on all levels! : music theory for tonic, subdominant and dominant; for an harmonic minor scale (A with the G#); and for your continuum of increasingly complex variations; to say nothing of being a fabulous etude for first position arpeggios! WE ALL LOVE IT!!! I play it at all kinds of events too! On Valentine's Day someone asked me to repeat "that gorgeous passionate piece where you played all over the harp!" Just wanted to express my gratitude at the beautiful musical compositions that you share with the world through your books of original music. I recently bought Moon over the Mountain and Sweepin' the Clouds Away and am so enjoying playing from these books. I look forward to adding some of these new tunes to my hospice repertoire, and I can't wait to play some of these tunes for my Harpers Hall friends. Your music just keeps getting better! A month or so ago while purchasing another piece of music from Melody's, I ordered your Sweepin' the Clouds Away book. Some of these pieces have immediately become from among my favorites. So nice. I absolutely love playing your music when I work at hospitals, people find it very soothing.